Independence Day is one of my favorite holidays – and July 4th is not quite the same without festive marches by John Philip Sousa. So here are three recorded in 1916 and 1917. If you enjoy these selections you might want to check out my July 4th postings from 2014 and from 2013. Those postings are just as timely today as when they were first put up. One nice thing about the recordings I feature: they are so “out of date” that they never go out of date! The first selection is “Stars And Stripes Forever” which is Sousa’s most famous work. He composed it in 1896. Since 1987 it has been the official National March of the United States. It has long been a staple of Independence Day concerts – but you don’t very often hear it performed by a marimba band as you do here courtesy of the Hurtado Brothers Royal Marimba Band of Guatemala in 1916. Personally, I think a marimba band is perfect for this kind of music – it makes such marches even more festive and cheerful. About fifteen seconds from the end of this recording you will notice that the volume suddenly drops and then quickly comes back up. I first noticed this when I was doing audio restoration work on the digital audio file. I actually pulled the record back out and played it again on the turntable just to verify that there had not been some sort of equipment malfunction when I was transferring the audio to digital. Sure enough, the temporary drop in volume was part of the record and not my equipment. I have no idea what might have caused it. It doesn’t sound to me like it was intentional on the part of the musicians. And, since it was 1916, this recording was made through an acoustic recording horn and things such as mixers and volume control knobs had not yet been invented. The next two selections come from a “hill and dale” grooved Pathe disc. Pathe was a pioneering French record company that opened its USA branch in 1914. 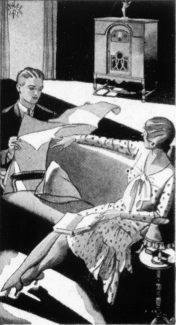 As was the case with Edison Records, because Pathe did not have rights to the patents for the lateral grooves used in conventional 78 rpm records, they had to continue using the vertical or “hill and dale” grooves that had previously been used on cylinder records. Pathe records require specialized playback equipment and cannot be played on conventional steel needle phonographs without ruining the record. (One can play Pathe-Actuelle records on steel needle phonographs). Sousa composed “The Invincible Eagle” for the 1901 Pan American Exposition, a world’s fair held in Buffalo, New York. The fair is best remembered as the scene of the assassination of president William McKinley. Sousa contemplated naming the march “The Spirit of Niagara” in honor of the famous waterfall not far from the exposition. But, since he thought that it was good enough to potentially rival “Stars And Stripes Forever,” he decided to give it a name with a grander scale. 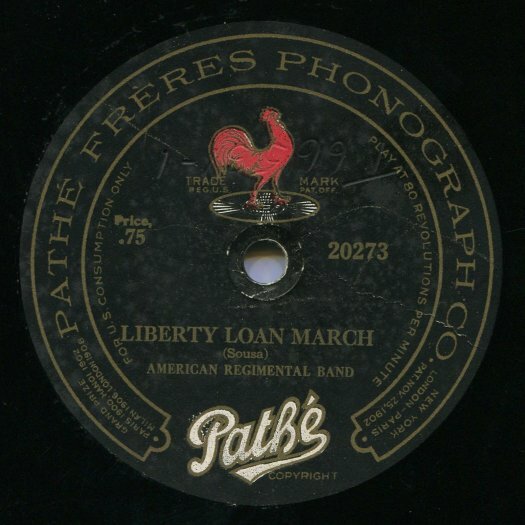 “Liberty Loan March” was composed in 1917 as part of Sousa’s effort to promote the purchase of Liberty Loan certificates used to finance the World War I war effort. This entry was posted in 1910s, Acoustic Recordings, American Recordings, Military Band. Bookmark the permalink.